Here is a complete summary of the novel in order to have in mind the places and characters. Beware, the whole story is described and the readers not knowing the novel might want to not read the following. Who is the best to tell the story but the author itself? The following is from a letter from J.R.R. Tolkien to Milton Waldman, Collins editor, written in 1951. "The main body of the tale, the Silmarillion proper, is about the fall of the most gifted kindred of the Elves, their exile from Valinor in the further West, their re-entry into Middle-Earth, the land of their birth but long under the control of the Ennemy, and their strife with him [....]. It receives its name because the events are all threaded upon the fate and significance of the Silmarilli ('radiance of pure light') or Primeval Jewels [...]. There was the Light of Valinor made visible in the Two Great Trees of Gold and Silver. These were slain by the Ennemy out of malice, and Valinor was darkened, though from them, ere they died utterly, were derived the lights of Sun and Moon [...]. But the chief artificer of the Elves (Fëanor) had imprisonned the Light of Valinor in the three supreme jewels, the Silmarilli, before the trees were sullied or slain. This Light thus lived thereafter only in those gems. The fall of the Elves comes about through the possessive attitude of Fëanor and his seven sons to these gems. They are captured by the Ennemy, set in his Iron Crown, and guarded in his impenetrable stronghold. The sons of Fëanor take a terrible and blasphemous oath of enmity and vengeance against all or any, even the gods, who dare to claim any parts or rights in the Silmarilli. They pervert the greater part of their kindred, who rebel against the gods, and depart from paradise, and go to make hopeless war againts the Ennemy. The first fruit of their fall is war in Paradise, the slaying of Elves by Elves, and this and their evil oath dogs all their later heroism, generating treacheries and undoing all victories. The Silmarillion is the history of the War of the Exiled Elves against the Enneny, which all takes place in the North-west of the World (the Middle-Earth). Several tales of victory and tragedy are caught up in it, and the passing of the Ancient World, the world of the long First Age. The jewels are recovered (by the final intervention of the gods) only to be lost for ever to the Elves, one in the sea, one in the deeps of earth, and one as a star of heaven [...]. The chief of the stories of the Silmarillion is the Story of Beren and Lúthien the Elfmaiden [...]. It is Beren the outlawed mortal who succeeds where all the armies and warriors have failed: he penetrates the stronghold of the Ennemy and wrests one of the Silmarilli from the Iron Crown. Thus he wins the hand of Lúthien and the first marriage of mortal and immortal is achieved [...]. For the capture of the Silmaril, a supreme victory, leads to disaster. The oath of the sons of Fëanor becomes operative, and lust for the Silmaril brings all the kingdom of the Elves to ruin [...]. His function [of Eärendil, an half-elf, father of Elrond], as a representative of both Kindred, Elves and Men, is to find a sea-passage back to the Land of the Gods, and as an ambassador persuade them to take thought again for the Exiles, to pity them, and rescue them from the Ennemy. 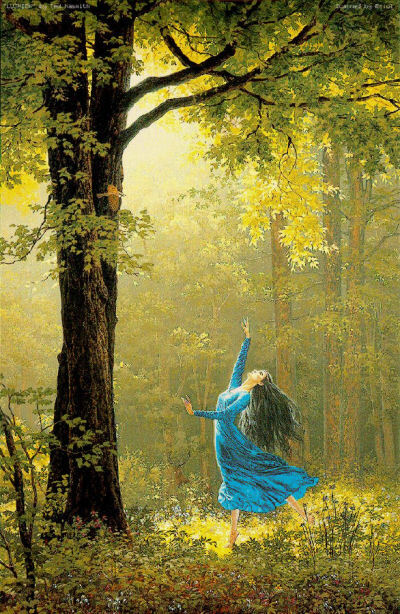 His wife Elwing descends from Lúthien and still possesses the Silmaril. But the curse still works, and Eärendil's home is destroyed by the sons of Fëanor. But this provides the solution: Elwing casting herself into the Sea to save the Jewel comes to Eärendil, and with the power of the great Gem they pass at last to Valinor, and accomplish their errand – at the cost of never being allowed to return or dwell again with Elves or Men. The gods then move again, and great power comes out of the West, and the Stronghold of the Ennemy is destroyed; and he himself thrust out of the World into the Void, never to reappear there in incarnate form again. The remaining two Silmarils are regained from the Iron Crown – only to be lost. The last two sons of Fëanor, compelled by their oath, steal them, and are destroyed by them, casting themselves into the sea, and the pits of the earth. The ship of Eärendil adorned with the last Silmaril is set in heaven as the brightest star. So ends the Silmarillion and the tales of the First Age." When one have in mind the story, the album cover is easy to interpret: it represents Morgoth (the Ennemy) on his throne, in the heart of its dungeon, Angband. The crown inserted with the three Silmarils is on its head. Some servants around him stare at a wraith dancing (that may be Lúthien) while the evil God is lost in his thoughts. So the cover is part of the concept, as well as the cover for the single Mirror, Mirror. It represents an elf walking in an ice desert. That would match with the chapter when the exiled Elves crossed the ice under the leading of Fingolfin. Analysing the actual song's lyrics and the one following in the track-listing will prove that hypothese is probably correct. Those lyrics are to be linked with the following excerpt, a few pages before the end of the Silmarillion (p 302-303): "Before the rising of the sun Eärendil slew Ancalagon the Black, the mightiest of the dragon-host, and cast him from the sky; and he fell upon the towers of Thangorodrim, and they were broken in his ruin." So the album starts with the final battle of the novel, when the Ennemy is vanquished and the Silmarils taken back after so many murders, battles and treachous acts. This is a prelude to the dark events that precede this victory and that are succesfully restitutes by Blind Guardian. 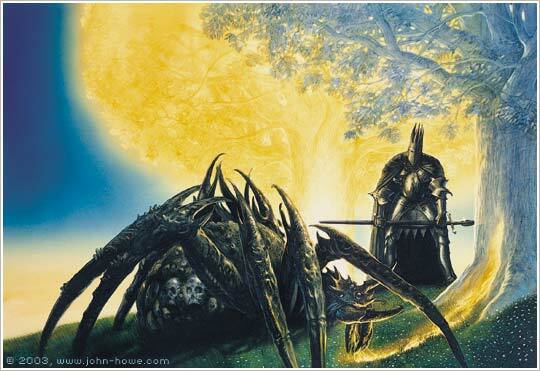 Morgoth resisted Ungolianth and the giant spider tried to strangle him with her web. Morgoth screamed and the listener can hear it in the next song, Lammoth. This is also the name of the region in which Morgoth scream can still be heard (Lammoth means Great Echo). The following song is the first one that can not be linked precisely to an event in the novel. The Curse Of Fëanor describes the thoughts of Fëanor after he swore to get back the Silmarils and to kill anybody who will claim a right on the jewels. This solemn oath will become a curse. Fëanor and his sons seed only death on their way, beginning with the battle for the boats in Valinor, where Elves killed other Elves. Fëanor and his children journey will bring them to Thangorodrim and the group is ambushed by Balrogs. Fëanor died from the hand of Gothmog, the most powerful of the Balrogs. Soon after one of his son, Maedhros, is captured by Morgoth and chained to the Thangorodrim. The voice heard on Captured is Morgoth mocking Maedhros, while the wind blowed on the mountain. 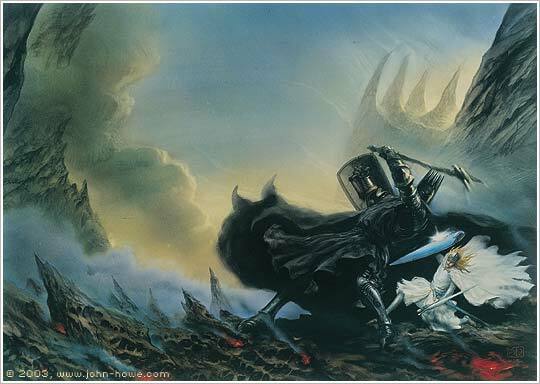 Fingolfin fought with courage and fended off several blow from Morgoth's war hammer: Grond. However Fingolfin died but managed to hurt Morgoth. He was celebrated as the greatest king of the Elves. The next song is The Eldar and is more difficult to interpret. Several websites indicates that it is about Finrod feeling death upon him when he was imprisonned in Sauron's dungeon with Beren and his companions. It is a possibility since the next song is about Finrod's death from the point of view of Beren. However there is no lyrics in the song naming Finrod so please consider this as an hypothesis only. Things are more evident for Nom The Wise. Finrod owed Barahir, father of Beren. Beren and Finrod are captured by Sauron while on their way to get back the Silmarils. Sauron sent a wolf to torture them and their companions died one after the other. When the wolf is getting near Beren, Finrod broke his chains and killed the beast with bare hands. So Finrod, called also Nom the Wise, died and Beren mourned him besides. The narrator of Nom the Wise is Beren: "Thus King Finrod Felagund, fairest and most beloved of the house of Finwë, redeemed his oath." (p 204). The lyric "She's woven both themes in there" refers both to the immortality of Elves and the mortal fate of Men: "For Lúthien wove two themes of the world, of the sorrow of the Eldar and of the grief of Men." (p 220). which is a reference to Beren returning from the dead. It is important to note that the album does not end with the end of the novel: Gondolin's fall is not told, as well as the lay of Túrin Túrambar and Eärendil's quest, which end with the death of Morgoth and the recuperation of the Silmarils. 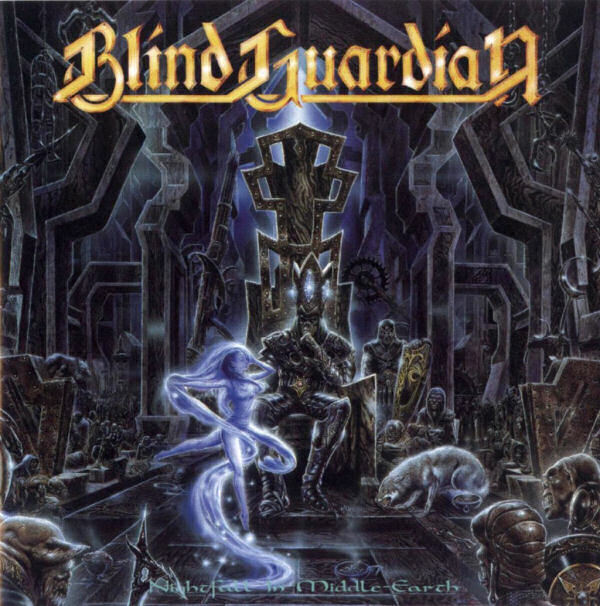 Maybe the bards of Blind Guardian keep that for a future album?